Guilford, Conn. : Lyons Press, c2009. What could be dangerous about butterflies? Investigative journalist Peter Laufer shows us there’s a lot more to butterflies than just looking pretty. This book is not about science. Nor is this book about the cultural symbolism of butterflies. It’s not even mostly about butterflies. It’s about people. How and why people care so much about and do such outlandish thing with and for the most beautiful insects in creation. If you believe in creation, which also gets chewed over a little. Laufer made a casual remark that he needed a break from heavy topics like war, immigration policy, and prisons. So, what’s his next book? Butterflies and flowers! But when a butterfly entrepreneur challenged him to really investigate the world of butterflies, starting with a jaunt down to Nicaragua, he bites. And what does he find? Why, danger and controversy, of course, and secrets and obsessions. And people with very strongly held but opposed views on butterflies and so much else. There’s lots of “who knew?” facts and plenty of “who thought this up?” schemes. 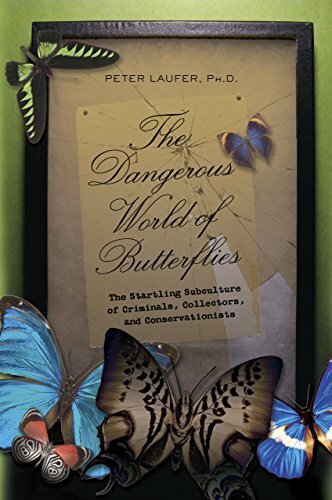 I doubt many readers will already be familiar with the role of butterflies across the wide range of issues covered—conservation, small businesses, human relationships with animals and the environment, law enforcement, national security, art, and religion. Peter Laufer is a journalist who has written a lot about war and other deeply depressing topics, and one day he concluded a real downer of a talk about his work with a joke: "That's why my next book is going to be about butterflies and flowers." Afterwards, an audience member wrote and invited him to her butterfly farm in Nicaragua. And thus, without quite intending to, he ended up writing a book about butterflies, after all. Except that it turns out that even butterflies aren't an entirely happy topic, and he ended up writing about butterflies whose habitats are shrinking or are located in troubled countries, the world of endangered butterfly smuggling, and bitter disputes between butterfly enthusiasts with a look-but-don't-touch approach and those willing to stick pins in them. Interesting. Very readable. Very journalistic. A lot about butterflies.